stated that the Aish Hatorah central office in Jerusalem ceased funding its Kyiv operations about five years ago, but Mr. Karasik decided to retain the name anyway. His programs continue under the general supervision of Rabbi Mordechai Raichenstein, a former Aish Hatorah rabbi in Kyiv. Rabbi Raichenstein now works in Mogilev and Gomel (both in Belarus) under the auspices of a different organization; he offers some guidance, but no funding to the Kyiv operation. JDC previously provided a small subsidy, and several different individuals and organi-zations support specific programs. Two families who live on the upper floors of the building pay rent. Igor Karasik, right, studied Judaism in Aish Hatorah programs in Kyiv. However, after Aish Hatorah withdrew from the city, Mr. Karasik retained control of the Aish Hatorah building and tries to operate various Jewish education and welfare ventures from its premises. Their newest program, said Mr. Karasik, is training Jewish-interest tour guides, a project that is funded mainly by the Hamama incubator venture of the Jewish Agency, but also will receive a subsidy from JDC. The tour guide program, which was scheduled to begin in the near future, had selected 15 young men and women for an intensive three-month course that would include Jewish history, Jewish tradition, Hebrew, and English. Upon completion of the course, individuals would be available for institutional or commercial employment to assist Israeli, American, and other scholars, researchers, heritage seekers, and tourists. Most of the instruction would be based in Mr. Karasik’s building, but, obviously, some training also would occur in the field. Mr. Karasik himself leads Jewish-interest tour groups in central and western Ukraine. He also arranges logistics for other groups that wish to do their own touring. Additionally, he teaches in and handles logistics for other short-term programs, including Shabbatonim, for various organizations. Among his other services, continued Mr. Karasik, is kashrut supervision for the Jewish Agency, JDC, and Midreshet Yerushalayim (Conservative movement). Most instructors and other professional staff at Aish Hatorah have other jobs that, in fact, are their primary sources of income, said Mr. Karasik. They work as teachers in Jewish day schools, staff members at JDC, or staff at other Jewish organizations. Mr. Karasik himself also works in the matza factory operated by Rabbi Yaakov Dov Bleich. Almost everyone needs a second income in order to survive, said Mr. Karasik. In response to a question, Mr. Karasik said that his organization no longer teaches STARS courses. The STARS organizers made a “political decision”, he said, to withdraw from his facility because, they told him, no rabbi supervises the overall program under his auspices. Mr. Karasik noted that his STARS program had been the largest in the city, enrolling some 80 young people. It had been transferred to Rabbi Bleich’s supervision, he continued, and it is unlikely, he said, that these numbers have been maintained by Rabbi Bleich. The well-stocked Jewish library in the building remains popular among local Jews. Its original collection was provided by JDC. Clearly, a major appeal of Mr. Karasik’s operation to outsiders is its very independence from outside supervision; yet this same lack of affiliation forces Mr. Karasik to constantly scramble for programs and funding sources. He openly acknowledges that he might be more successful in generating work and attracting sponsors if he spoke English. Most money for Jewish programs is still coming from overseas, and Mr. Karasik finds it difficult to make a case for his programs and services when he is required to speak through an interpreter. The general Jewish philosophy of his operations appears to be an open modern Orthodoxy. 65. 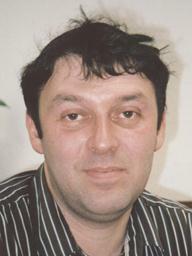 Iosif Akselrud, the Director of Hillel CASE (Hillel in the post-Soviet states outside Russia), also serves as Chairman of Limmud in Ukraine on a volunteer basis. Modeled on the original Limmud programs in England, Russian-language Limmud promotes Jewish education on a variety of subjects through conferences and events. Major forthcoming Russian-language Limmud seminars in or near Ukraine are scheduled for Vinnytsia in June, Odesa in October, and Kishinev in November, said Mr. Akselrud. His responsibilities in Limmud dovetail very nicely with his responsibilities in Hillel, Mr. Akselrud stated, because 70 percent of Limmud participants are Jewish students. 66. Moishe House opened in Kyiv in August 2010, one of 37 such houses worldwide. The Kyiv program currently accommodates three young women as residents in a well-located relatively large and well-maintained three-bedroom apartment. The international Moishe House organization pays more than 50 percent of expenses for the group, but the young women themselves share other costs. In return for the Moishe House subsidy, the residents are obligated to plan and manage a large number of Jewish events for other Jews in their twenties. Such events include Shabbat dinners, book clubs, discussions, group participation in Jewish community celebrations, and other experiences. With program ideas and other assistance from the Moishe House headquarters in California, the Moishe House vision is to connect young Jews with their communities, encourage pluralistic Judaism, and build Jewish leadership. Two of the three young women in Kyiv Moishe House work in the Jewish community, one at the Israel Culture Center attached to the Embassy of Israel and the other at Lo Tishkach (See below.) The third is a lawyer. Several had heard about Moishe House through the Ukrainian Union of Jewish Students, an indigenous organization said to be more loosely structured than Hillel. One had learned about it while studying at Paideia, a Jewish studies program in Stockholm. 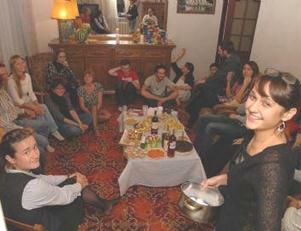 Jewish young adults gather for an evening event in the living room at Moishe House in Kyiv. For information on Hillel in Ukraine, see pages 97-98.